From magazine and newspaper ads to series program and sponsor ads, our designers enjoy few things* more than seeing effective, eye-catching print ads through to completion. Our concepting, copy writing, photo directing and design can be seen in print advertising around the country that we plan and place for our clients. 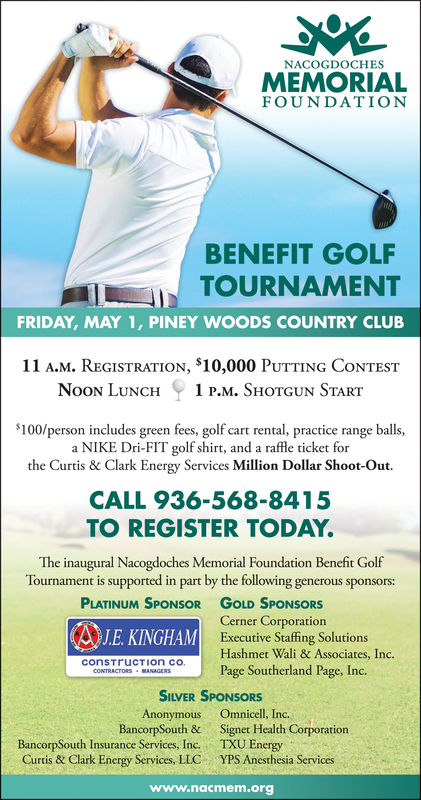 To promote the inaugural Nacogdoches Memorial Foundation Benefit Golf Tournament, Nacogdoches Memorial Hospital started at Point A.
Texas Highways Magazine: The Official Travel Magazine of Texas readers discovered some of the many reasons why families love to Visit Lufkin! Go on a safari in the pines at the Ellen Trout Zoo [official], unearth history at the Naranjo Museum of Natural History, take a scenic canoe trip during the Neches River Rendezvous, or set up camp and cast a line from an accessible pier at Cassels-Boykin Park. 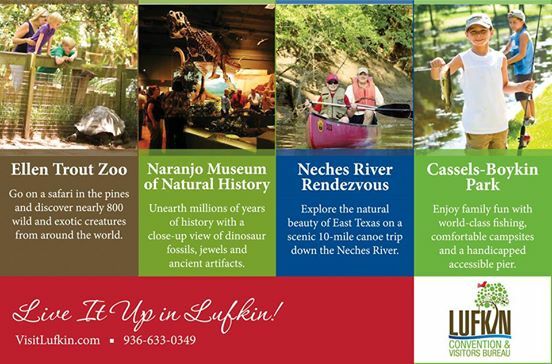 Make your own travel plans with the help of the Lufkin Convention & Visitors Bureau at www.VisitLufkin.com. This Texas Blueberry Festival announcement in Texas Coop Power Magazine was more than an ad. This win-win-win partnership between the Nacogdoches Convention & Visitors Bureau and Nacogdoches County Chamber of Commerce funded the ad that followed a contest requesting readers to share their very best blueberry recipes. Select recipes from around the state were prepared in the Austin kitchens of Texas Co-op Power and judged by a prestigious panel of food editors for their use of the star ingredient, accuracy and the results of the final product. Further cooperation garnered a prize package for the winning recipe developer from the good people who own the Hardeman House Bed & Breakfast and Heart of Texas Gift Gallery. 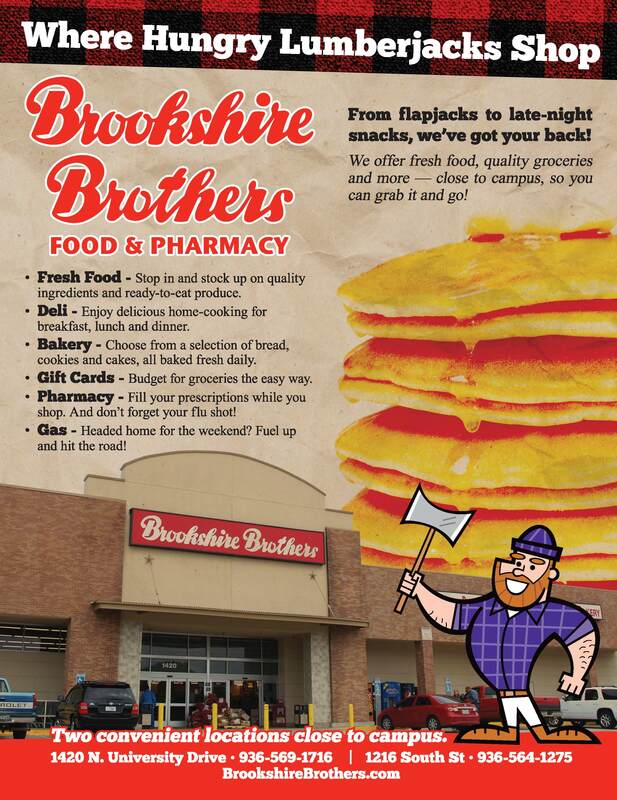 We can't fail to mention the festival's presenting partner - Brookshire Brothers. Plus, we all get a pretty fabulous Blueberry-Almond Coffee Cake Muffin recipe out of the deal! 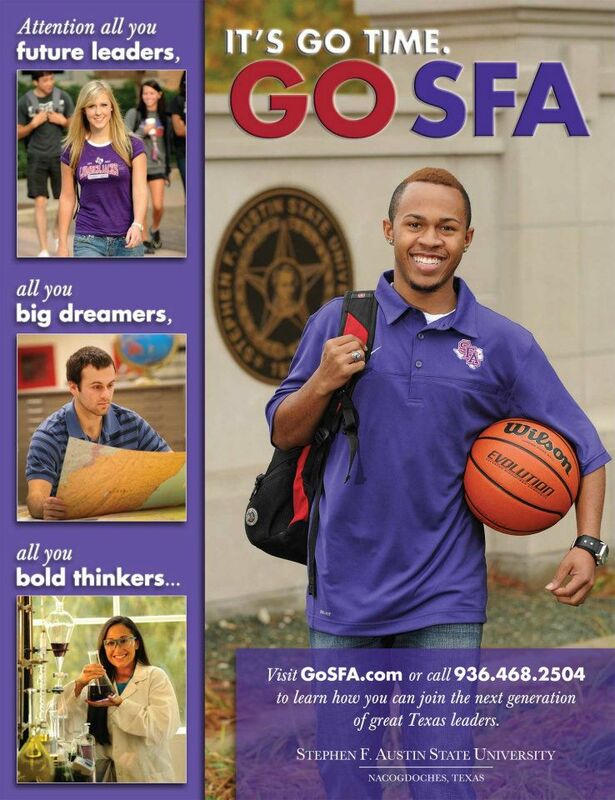 This Stephen F. Austin State University ad for the Dallas Mavericks Yearbook started with a student basketball snaphot and the directive to "come up with a new concept." We rolled from there and build on the Office of Admissions' "gosfa.com" website to develop this active/directive ad idea that can serve as the basis for an entire campaign. 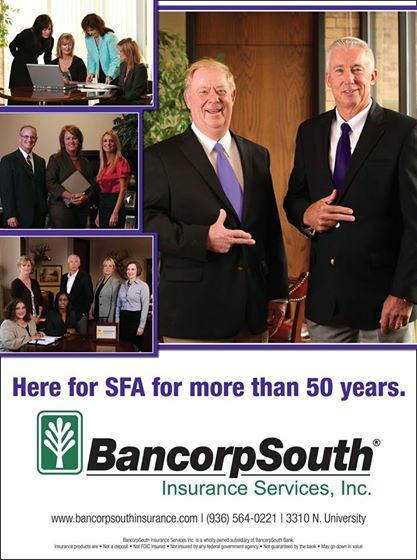 This ad for SFA Orientation Programs' guide book introduces new students and parents of new students to Brookshire Brothers. With fresh food, deli, bakery, gift cards, pharmacy and gas, the neighborhood stores have everything a new Stephen F. Austin State University Lumberjack needs in Nacogdoches, Texas. 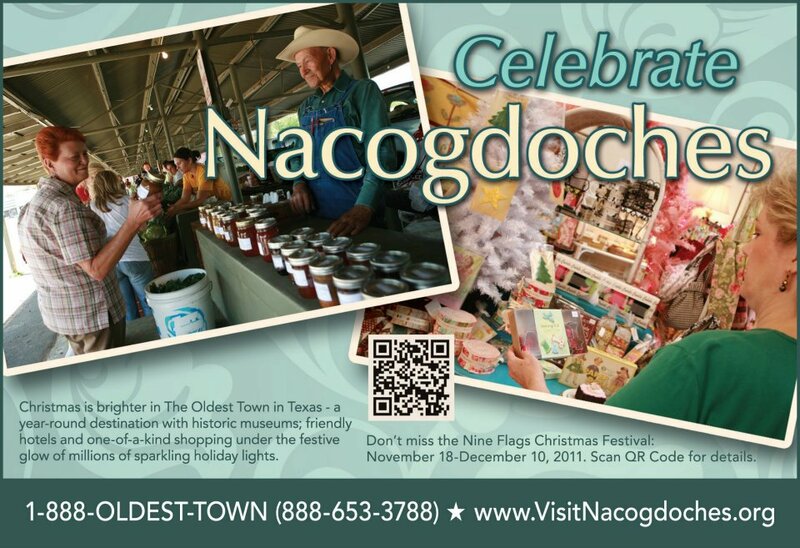 This holiday ad for the Nacogdoches Convention & Visitors Bureau shows off "Only in Nacogdoches" downtown shopping opportunities, while invited visitors to learn more about what's happening in Nac via the custom QR code. 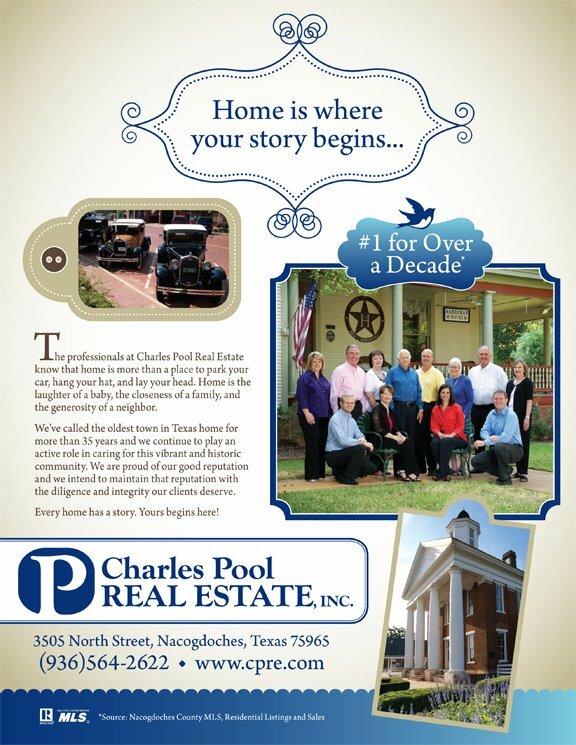 This image ad for Charles Pool REAL ESTATE, Inc. anchors the professional team as experts in the town they know and love. Feeling limited by a publication that only offers black ink? Well, don't be! You can make a big impact and still be consistent with your design theme in greyscale. Looking good, PineyWoods Pediatrics! 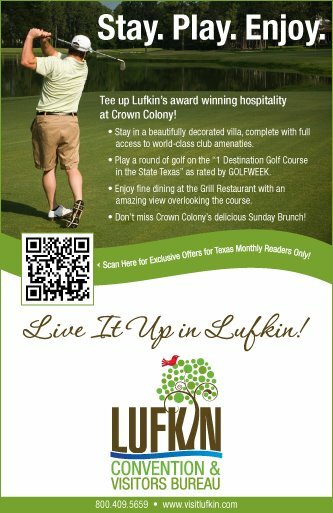 This Lufkin Convention & Visitors Bureau ad welcomed visitors through a special golf section in Texas Monthly. Adding a scannable QR code loaded with tons of techno-directions gave readers the opportunity to interact with the ad (and VisitLufkin.com) for exclusive offers. *Those things, in order, are lunch, tailgating at college football games, dachshund races and family reunions.